OK Sealer has added continuous monitoring devices to its medical sealers to provide a constant heat seal for every pouch. Heat-sealing equipment in particular is experiencing several advancements or enhancements. 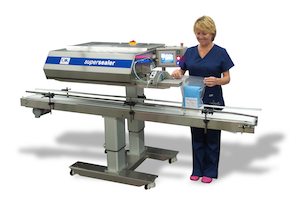 Following are four key changes you should expect to see—or should request—in your next new heat sealer. The main purpose of any packaging system used for terminally sterilized medical devices is to preserve sterility until use. Validation of packaging processes is crucial to guarantee that the integrity of the packaging system is always ensured and maintained during transport and storage until the time of use. Most heat sealers today are equipped with a number of features to help users validate the heat-sealing process, such as digital temperature controllers and alarms for unmet parameters. While these features certainly help packagers set, verify, and maintain sealing temperatures for an accurate, repeatable process, they may not be enough. Temperature control is important, but delivering that temperature is what it is all about. For this reason, continuous-monitoring devices can be incorporated into medical sealers to provide a constant heat-seal temperature for every pouch. If the detected temperature is above or below set parameters, alarms sound and sealing ceases. To ensure that heat is delivered uniformly to the machine elements responsible for sealing, thermocouples can be placed in sealing areas. Depending on the type of interruption and the severity of the consequences, some manufacturing systems require PLC redundancy to keep people and equipment safe. This basically means the systems have been thoroughly tested, are regularly maintained, and have redundant components installed to ensure continuous operation. Environmental impact (material waste) has become an increasingly important factor in design and specification of medical packaging. It is especially important when selecting materials and deciding on a final package design. Sustainability is controlled by choosing film options that are easy to recycle. Converters can create resin mixes that are easily separated for placement in the recycle stream. PE and PET offer qualities such as clarity of material, toughness, and ease of processing for converters. The hospital environment is evolving to allow for a smooth recycling stream transition for these types of packages. PET and PE can be recycled and returned to the market at a very clean and high grade, owing to the already sterile environment of hospitals. In terms of cutting waste in the packaging process itself, if waste were to be itemized and categorized, manufacturers could get a better sense of where waste-reduction practices could be most beneficial. Leftover packaging, or scrap plastic like plastic trim, can be reintegrated into the packaging production cycle. Multiple manufacturers accept collected packaging waste from their products and then use the waste to make new products or packaging. And while waste reduction largely relates to material selection and processing, reducing the amount of out-of-spec sealed packages through machinery monitoring and redundancy can also make a difference. FDA’s final Unique Device Identification rule requires that most medical devices distributed in the United States carry a unique device identifier, or UDI. A UDI system has the potential to improve the quality of information in medical device adverse event reports, which will help FDA identify product problems more quickly, better target recalls, and improve patient safety. Furthermore, UDI reduces medical errors by enabling healthcare professionals and others to more rapidly and precisely identify a device and obtain important information concerning the characteristics of the device. It also allows manufacturers, distributors, and healthcare facilities to more effectively manage medical device recalls. Multiple sealing equipment manufacturers have enhanced their systems to help medical device packagers comply with UDI requirements. Caption: OK Sealer has integrated a UDI Thermal Ink Jet coder with the sealer along with a Keyence Reader. All components are run through one HMI and sealing and coding are done in one step. Medical device manufacturers can benefit from the evolution of heat-sealing systems. Users should expect to see constant monitoring of the sealing process, built-in redundancy, efforts to reduce material waste, and enhancements such as UDI capabilities. To learn more, visit OK Sealer at Booth # 1646 the upcoming MD&M East 2018 expo in New York City June 12-14. Ann Marie serves as vice president of OK Sealer and product manager of the sealer division in Marlborough, MA.